Showing 1 - 12 of 12 articles tagged "Castle Rock"
Paul Sparks will take over Garrett Hedlund's role in Season 2 of the Hulu series. The Stephen King-based drama was originally billed as a limited series. Each episode of the Hulu series is loaded with references to King characters, books and films. Hulu's new Stephen King-themed series from J. The psychological horror-drama from Stephen King and J. The Fargo alum will play the sister of Melanie Lynskey's character on the Hulu drama from Stephen King and J.
Hulu brought Kaling on stage at its upfronts presentation this morning to slam the streaming service's competitors. 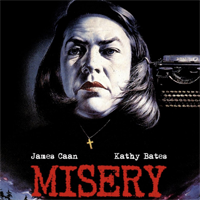 From Carrie to The Shawshank Redemption, the Stephen King-inspired horror drama contains numerous references to the famous author's influential work. The two previously worked together on Lost and Alias.